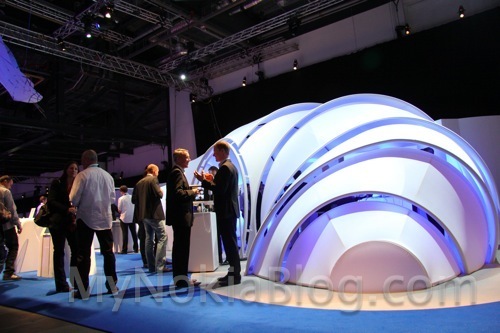 OK, locked away upstairs in a bright white silk cocoon is Nokia’s Future experiences. I would have missed it if it weren’t for Jan who directed me to some of the cool stuff they’ve got going. I might not be able to show you videos right now but trust me, it looks awesome. Hydrophobic – afraid of water. This is super hydrophobic so it’s really scared. Haha. Remember Stephen Elop mention the things (ultra thin waterproof coating) Nokia has locked away in research and has not yet made it to market (something he wants to rectify). Well we got a demo of that graphene coating on a Nokia 700. Without it, drops of water falling on the screen sticks. With the graphene coating, it runs away scared. Literally. It tries to move move away. When shot in SUPER slow motion, the water bounces off like as if it wasn’t a liquid and then scatters away, not leaving any marks. They even had this spectacularly cool toy maze but instead of having a ball bearing, the maze was coated in this nano material, repelling water so it just forms a structure that you can propel by tilting the toy maze. That on it’s own can be put to use right now. The good thing is, they said it’s not that expensive. Eventually they say this could work towards that waterproof device. Coat the inside and without changing the structure of the phone (so that it has to look like a rugged waterproof), you have, still an elegant design but something that can be submerged in water and still come out fine. I asked whether that meant non-removable devices only, but they said, that wouldn’t necessarily be a limitation. As long as the seal is done right. 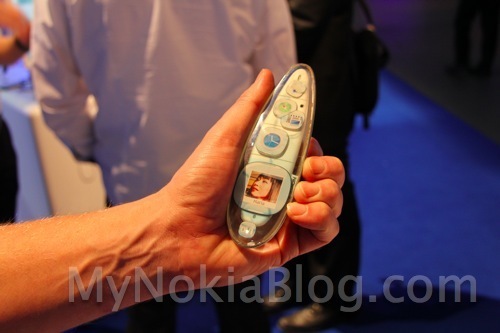 You remember the Nokia Morph right? I didn’t totally this, but we’ve seen it before, something to do with sensors. "Human Form" There's a video demo that neatly shows off what this thing could eventually do. Saving the best until last, we have something that really captivated all who saw it. 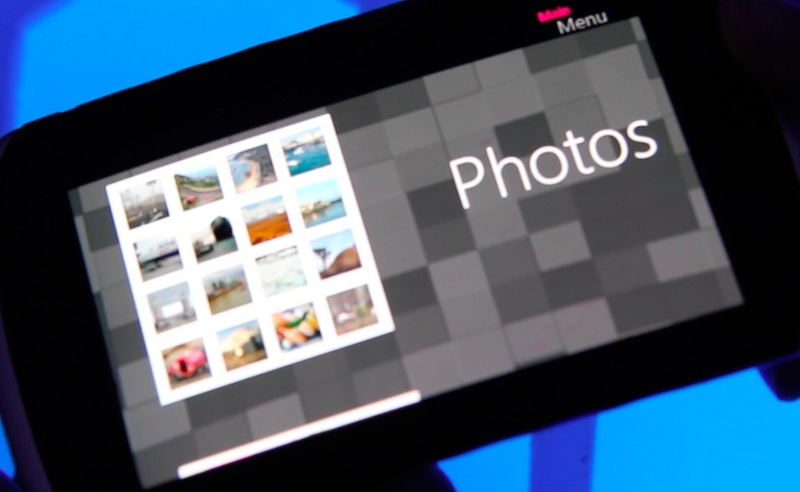 Imagine a large screened phone but the display and phone is bendable. You can curve it outwards, you can curve it inwards, twist it one way, twist it the other, bend/twist in various strengths. Although still research stage, what I saw looked quite compelling. It was a very natural movement, almost too natural once you started using it a bit. That was just some of the things they showed. Putting it all together, it seemed like that this stretching, bending, twisting, changing, morphing, sensing, nano materials – it was like slowly, Nokia Morph is becoming real. I’ve got a video uploading. Hopefully it appears some time in next hour so I can update it and show you. A party is apparently going on right now, but, ah readers, I want to share this with you guys first.